For many years the people of Pinner have had ambitions to celebrate a great artist who once lived amongst them - the illustrator William Heath Robinson. 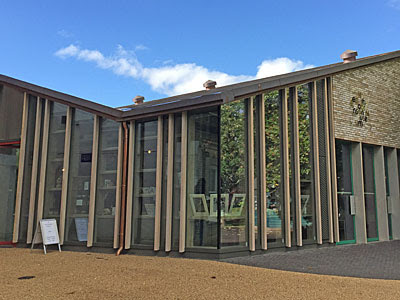 The William Heath Robinson Trust hold many of his humorous artworks, and plan to showcase them in a new museum at West House in Pinner Memorial Gardens. But the old mansion requires considerable restoration, at great cost, and completion remains some years off. The Pinner Association continues to campaign and fund raise, and will hopefully provide the town with its first steampunk tourist attraction. The Chairman of the Trust told me that plans are well advanced, following two decades of fundraising and a million-plus Heritage Lottery grant. If the last hundred thousand can be found then building work can begin on the car park next spring, and a brand new Heath Robinson Museum opened in 2016. It's inspiring stuff, and will hopefully bring these wildly inventive works to a new generation. 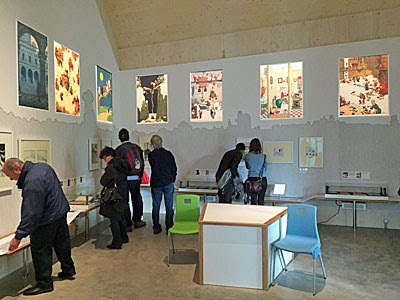 And in 2016 I'm delighted to report that the Heath Robinson Museum is finally open. The official opening ceremony was on Saturday afternoon, attended by the Mayor of Harrow, a Lottery representative and the Merrydowners Morris Dancers. Local poet Michael Rosen cut the ribbon with the aid of a suitably complex contraption designed by pupils at a Northwood girls' school. And then the public poured in, supposedly 300 in number which is a fantastic total for a small museum... unless you're intending to look at the exhibits, that is, which is why I left my visit until Sunday. 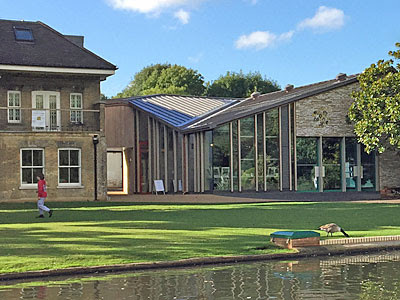 The museum's at the top of Pinner Memorial Park, barely five minutes from the tube, behind a landscaped lake. Alongside is West House, a minor mansion left municipally bereft, but separately upgraded a few years ago to house a cafe and a chiropractors. Where I remembered a car park there was now a large angular cabin, seemingly two-storey, with two sides mostly brick and two sides mostly glass. Initially I walked up to the wrong front door, thinking the way in would be via the big doors under the main sign, but no, that's the Activity Studio for school visits. Instead access is up the side, by the wooden overbridge, to save you looking quite so lost. 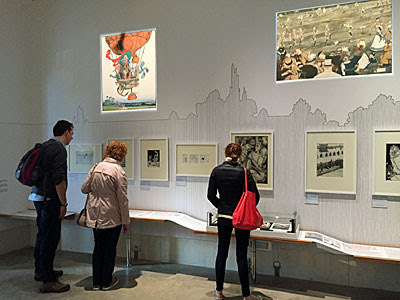 There are two galleries, one for the permanent display and one for special exhibitions. The main room is laid out with William's life story and a wide variety of his works, to show his evolution from early illustrator to national treasure. Initially everything was in black and white, but WHR later broke out into colour for a series of lavish gift books, and a dozen such pictures decorate the upper wall. Lower down are framed prints and numerous books and magazines in cases, well worthy of scrutiny to catch all the detail and tiny in-jokes. Frustratingly they're not yet labelled to match the numbered keys in the exhibition's text, so it's not always easy to work out what's what... but, early days. 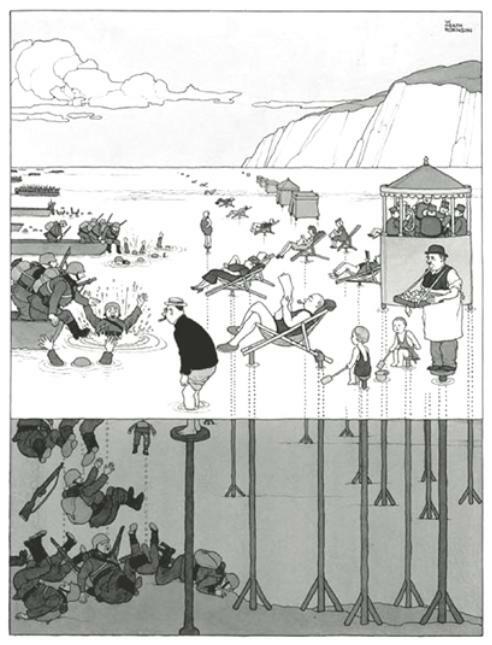 Heath Robinson's career really took off in the 1930s with commissions for magazines and advertising, for example comparing The Hovis Family to the chaos taking place at dining tables elsewhere. His contributions to the "How To..." series were much admired, for example the labour-saving and space-efficient gadgets depicted in How To Live In A Flat. Critics admired his "absurd activities taking place in beautifully realised settings", with their quirky complexity often concealing a sharply-observed social message. But William still secretly preferred his watercolours, which never quite earned the same acclaim as his penmanship. 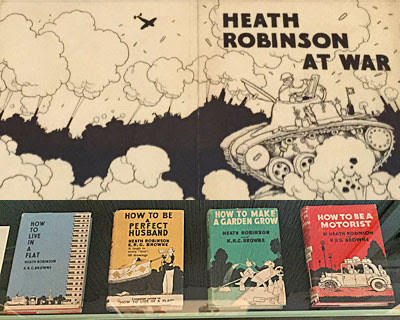 The museum's first special exhibition looks at Heath Robinson's wartime illustrations, many of them saved for the nation last year by the National Heritage Memorial Fund. Of the 50 frames on display half cover the First World War and half the Second, including in the former William's only foreign trip, as war artist for the American army in France. The WWII batch are more fun, but then they were meant to be, featuring in Sketch magazine from 1940 in their "To Cheer You Up" section. Most show soldiers coping against the enemy in amusing ways, and because all the pictures are portrait rather than landscape there's often detail in the air as well as underground. A typical print would be "The sort of thing you are not supposed to do with your air raid shelter", including upturning it and adding balloons, but my favourite (and that of the volunteer on duty) was definitely "Deceiving the invader as to the state of the tide". One thing you need to know if you visit in the next month is that the museum's not quite finished. All the bits are in place but the building's still in need of finalisation, so the builders are popping back to do some 'snagging'. The lighting's a bit of an issue at the moment, with certain lamps not yet in place and the skylights in the closed position. It's also best I don't recount my experience at the cash desk on my way in, because any new operation deserves some leeway on its opening weekend. Upstairs may look tempting but is roped off, this being where the reserve collection is housed which will feed into future exhibitions. 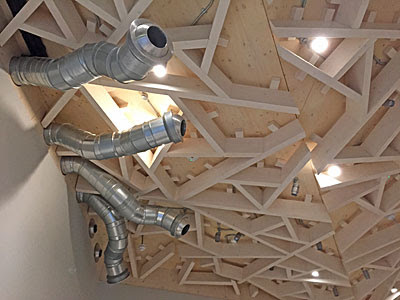 The ceilings look great, though, with complex wooden structures and air conditioning units deliberately sculpted to look more than a little Heath Robinsonesque. 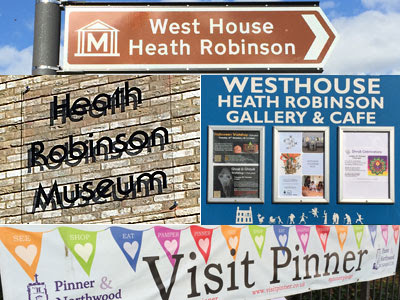 For the next few weeks the Heath Robinson Museum is open Friday to Sunday only, 11am-4pm, but this is due to extend to six days a week before Christmas. Admission costs £6, which I thought was fair for 45 minutes deliberation, plus they're still paying off the costs of the building so every purchase in the shop helps too. There are Heath Robinson books and cards and prints aplenty, plus a 2017 calendar, plus several books on local history to satisfy the local audience. As yet there's not much synergy between cafe and gallery - you could easily visit one and miss the other. But it is brilliant that decades of hope and effort by the people of Pinner have paid off, and there is now a genuine reason to visit.